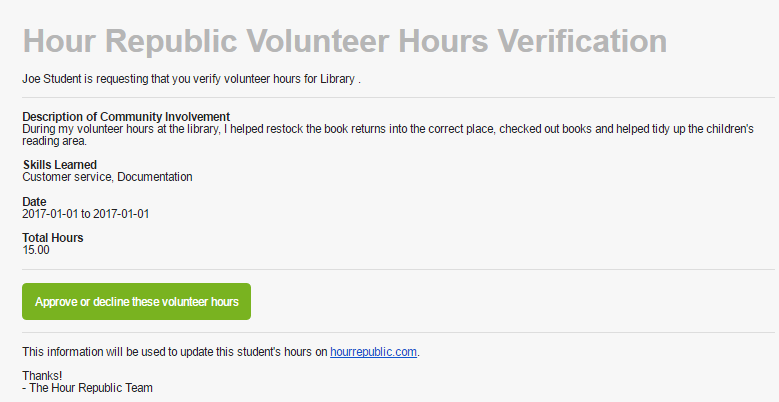 How do Parents/Guardians verify volunteer hours? Q. 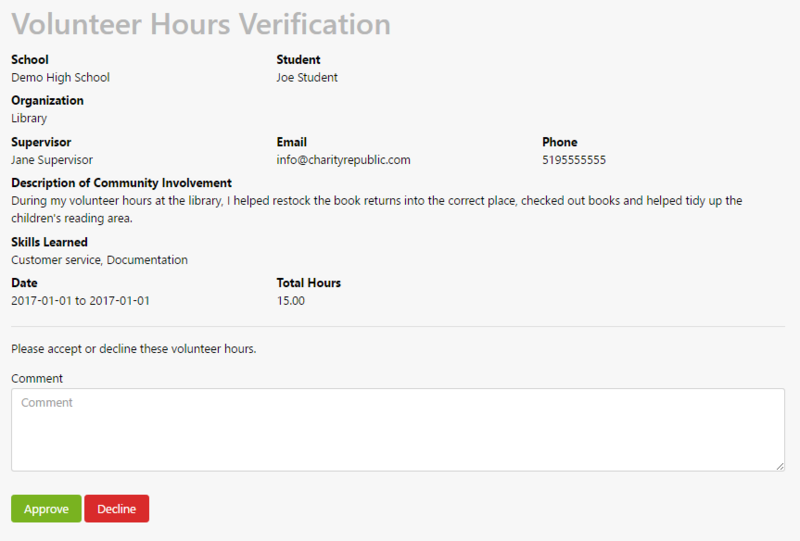 Are Parents/Guardians required to create an account to verify volunteer hours? A. No, parents/guardians are not required to create an account. Students have an account where they can add and submit their volunteer hours and parents/guardians will receive an email in which they can accept or decline a student’s hours as well as leave a comment. Q. How do Parents/Guardians verify volunteer hours? Once a student has filled out and submitted their volunteer form, Parents/Guardians will receive an email to verify the hours. A new window will open to review the student’s submission. Leave a comment, and choose to Approve or Decline the submission. NOTE: Click here to review how to download summary reports for all students. Under the Active column, select the green check mark beside a student’s name. This will turn the check mark into an “x”. The student account is now deactivated. Student account settings can be accessed by students and teachers, and includes detailed information related to a student’s account. For students, hover over your name and select Settings. For teachers, select an individual student from your dashboard, then select Edit Settings. On your teacher’s Volunteer Dashboard, hover over and click on a student’s name in order to view an individual student dashboard. Here you will find a summary of an individual student’s hours and activities. Each entry of hours and activities has a status. Status definitions can be located here. A teacher can add hours on behalf of a student. Click here for more details. A teacher can update and edit student account settings (e.g. email address, parent information). Click here for more details. Teachers can add hours for groups of students and batch approve all hours at the same time. Enter the number of hours for each student. TIP: Use <Ctrl> F to find students. Select the Reports button on the Volunteer Dashboard to view summary and detailed reports. This is a brief summary on your students’ progress including number of pending and verified hours (PDF and Excel format). This is a full report on your volunteer students’ progress, including hours, organization contact information, and details related to each activity (PDF and Excel format). Select a student (hover over name and click), then click the Hours Report button to print a PDF summary report for an individual student. Teachers can also print off a report for individual activities by selecting the student > click on Edit > click Download Hours Report. Can I approve student volunteer hours and activities? Guidance can approve individual hour entries for a student, or all entries. Select an individual student, then select the Approve All or Unapprove All buttons on a student’s Volunteer Dashboard. This approves all hours and activities listed on the page. Or, approve individual entries by selecting the entry, then clicking Save and Approve. A green check mark appears on a student’s dashboard when hours have been Guidance approved. NOTE: Verified hours have been verified by the organization AND parent. For an overview of the different statuses (e.g. Draft, Pending, Verified, Declined), click here.